At first glance, Berwick Street is a quiet cul-de-sac: a safe place to raise a family and enjoy retirement. But in the dead of winter when most Berwick Street residents have already headed south to escape the bitter cold, something evil lurks in the coming snowstorm. A group of followers with specially-honed powers of destruction seeks final retribution for events that occurred more than four hundred years ago! Aided by a teenager with precognitive abilities, an unlikely trio of women--Cassie, an introvert in her twenties; Rebecca, a sixty-five-year-old grandmother; and Mabel, an ailing octogenarian who has outlived her husband and sons--must face the coming onslaught. WHO WILL PREVAIL? 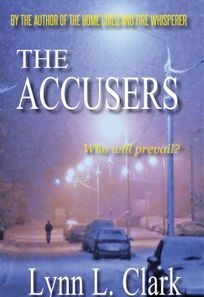 Ask your local independent bookstore to order THE ACCUSERS in paperback for you. It's available world-wide through the Ingram catalog. You may also order the paperback online through Amazon.